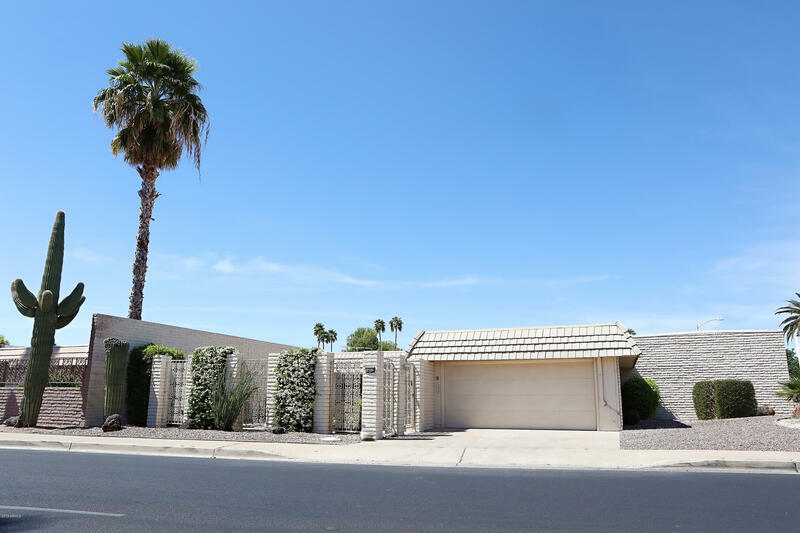 All Sun City homes currently listed for sale in Sun City as of 04/18/2019 are shown below. You can change the search criteria at any time by pressing the 'Change Search' button below. 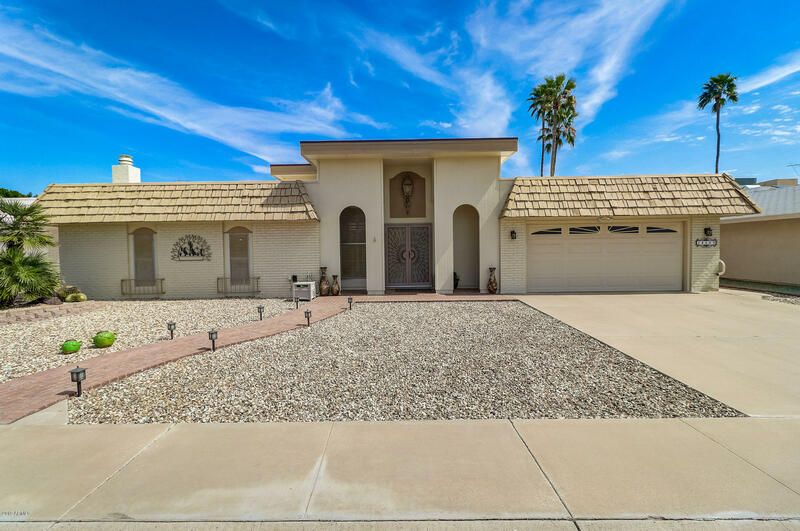 If you have any questions or you would like more information about any Sun City homes for sale or other Sun City real estate, please contact us and one of our knowledgeable Sun City REALTORS® would be pleased to assist you. "Car enthusiasts dream! 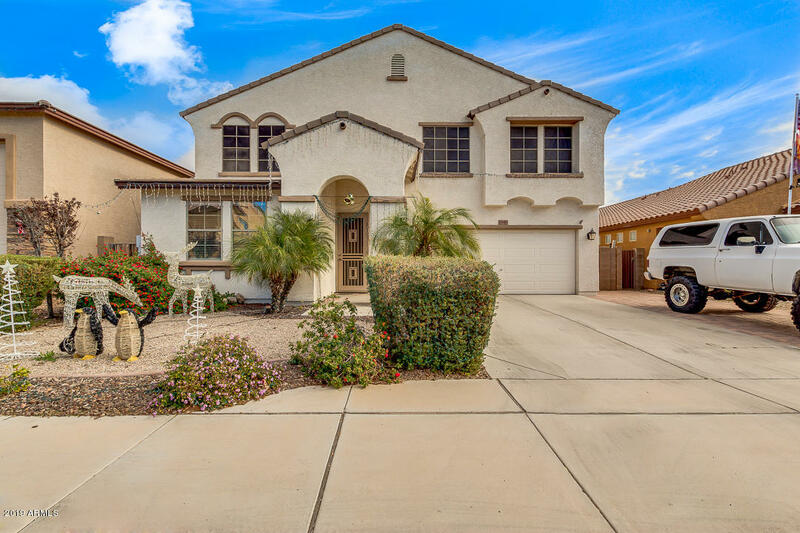 Amazing 2 story home in Rancho Estates in excellent condition! $3,000 range allowance will be given to Buyer. Carpet-'19. Exterior painted-'19. Horse property. Property is 1 1/2 acres+ and zoned for adding 10,000+SF garage/structure. Unique opportunity to own in Sun City without having to belong to SC Rec Centers. Joining is optional. For more details please contact listing agent." "Unique one of a kind home on VIEWPOINT LAKE! 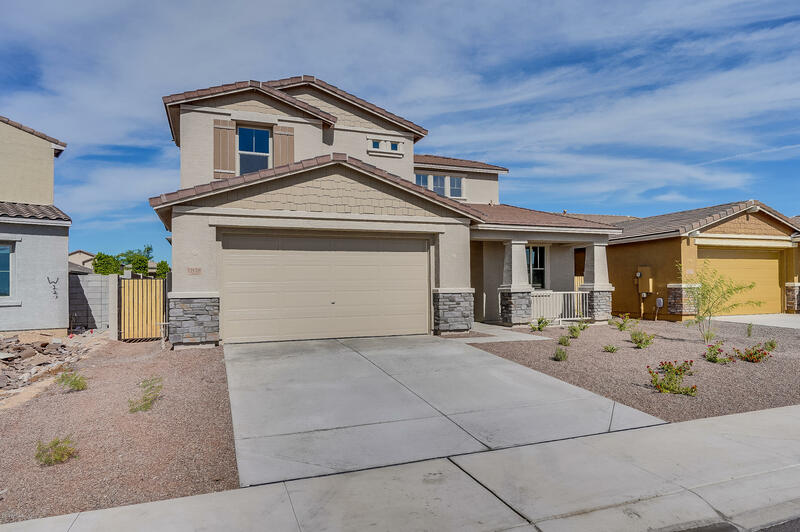 2865 sq ft open floor plan home with two masters plus guest room and three baths (two with a shower and one full bath with tub). Located on a large corner lot with lush vegetation, extended patio, a sturdy concrete boat dock and beautiful green grass in the back yard. Entry to the home is through a pretty courtyard with a sun screen cover. Owner has replaced all windows and sliding glass doors with energy efficient ones. 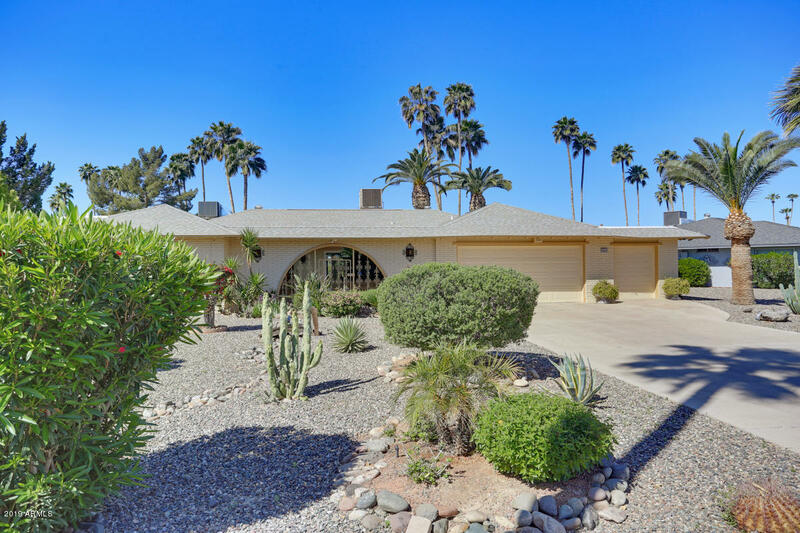 Kitchen has pretty granit"
"This sprawling CORNER LOT ranch home, with a long CIRCULAR DRIVEWAY, sits on nearly an acre of LOW-MAINTENANCE desert landscape. Enter through double doors surrounded by peaked GALLERY WINDOWS to find a dramatically displayed piece of natural Onyx. Sweeping great room with HIGH CEILINGS is perfect for entertaining. RENOVATED KITCHEN has custom cabinetry, GRANITE COUNTERS, and breakfast nook. Adjacent FULL-SIZE DINING ROOM has views to the spacious backyard. 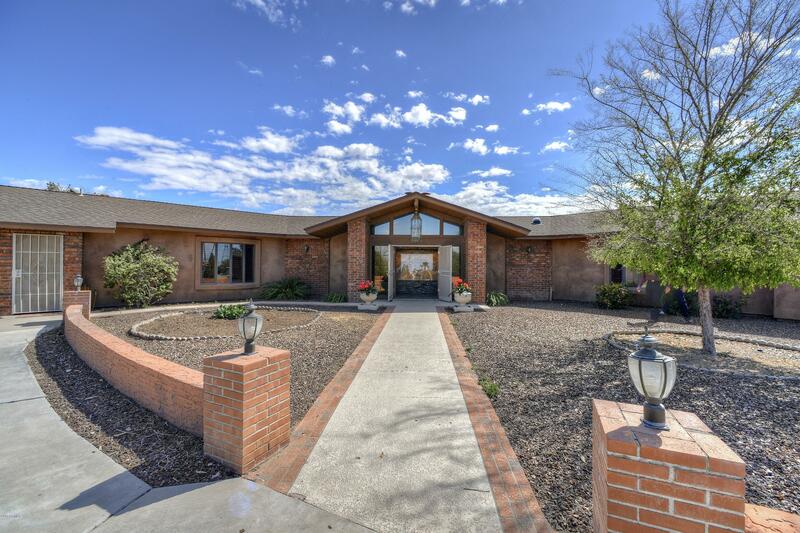 Master suite features SPLIT HIS&HERS "
"BEST-PRICED lake property in Sun City! ROOMY 3 bedroom, 2 bathroom home on Viewpoint Lake with your own boat! Fully furnished and ready for those that crave a water view. 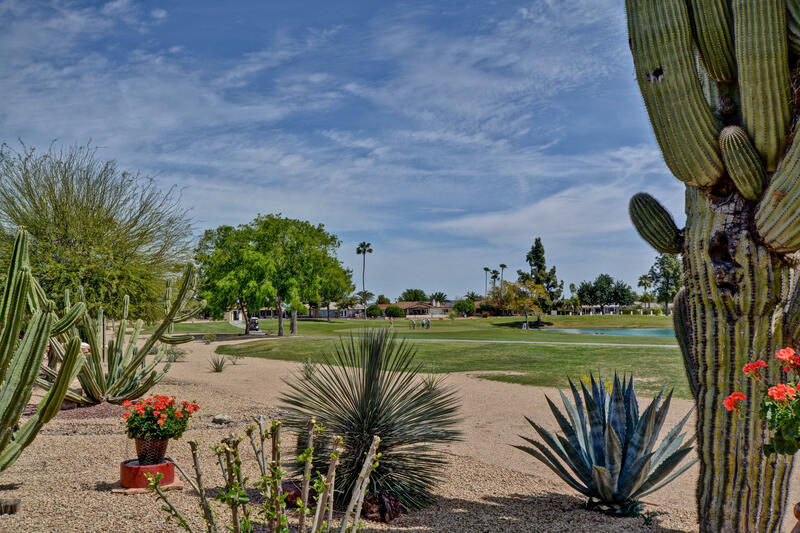 Fishing OK. Age-restricted community [55+] with amenities including 7 recreation centers, 8 golf courses, 2 bowling centers, outdoor amphitheater, 33-acre man-made lake, and dog park. This one has everything ready for you but a toothbrush, shorts, tank & sandals...."
"This is not your Grandma's Sun City home! From the moment you arrive you will be astounded at the updates to this home. Paver driveway, stucco exterior and designer garage door add elegance to the curb appeal as you approach the gated courtyard. Once you enter, this modern great room home with the expanse of Willow Creek Golf Course and lake view will take your breath away. All new Pella windows, new roof 2018, remodeled kitchen with granite, breakfast bar and stainless appliances, electric fir"
"LIGHT, BRIGHT ENTERTAINER'S DELIGHT*LOCATED IN PHASE 3 ON THE 1ST FAIRWAY OF WILLOWCREEK GOLF COURSE*3 BR/2.75 BA OR 2BR W/DEN-OFFICE AND ITS OWN BATHROOM! XL GREATROOM WITH SOARING CEILING FILLED WITH WONDERFUL NATURAL LIGHTING *NEUTRAL TONES*CHIC INSET CARPETING*DESIREABLE DIAGONAL TILE*TILE MEDALLION INSET AT DOUBLE-DOOR ENTRY*GUEST QUARTERS WITH ONSUITE BATH AND VANITY*UPDATED KITCHEN W/ ROLL OUT SHELVES & OVERSIZE DOUBLE OVENS*WET BAR*FLAGSTONE BACK PATIO FEATURING FOUNTAIN*ROLLER SHUTTERS"
"STUNNING!! 5 Bedrooms, 3.5 Bathrooms & 4 Car Garage. Not a 55+ Community. Located on a private Cul-de-Sac lot & next to a greenbelt, this spotless home offers a perfect layout. Freshly painted exterior. You will love the incredible foyer & entryway that expands to a large staircase making its way to the second level. The lower level showcases a large formal dining & living room that leads to a large kitchen with an granite countertops, island, stainless steel appliances, dual oven, recess"
"FABULOUS STUCCOED HOME ON THE 6TH FAIRWAY OF PALMBROOK GOLF COURSE WITH A NICELY LANDSCAPED YARD AND WONDERFUL VIEWS. YOU WILL LOVE THIS HOME WITH ITS LARGE GREAT RM WITH RAISED CEILING, NEUTRAL TILE WITH FLOOR ELECTRICAL OUTLETS, RECESSED LIGHTING, CUSTOM WALL DESIGN WITH ELECTRIC FIREPLACE AND DISPLAY AREA, LARGE WINDOWS ACROSS THE BACK W/FABULOUS VIEW OF BACKYARD & GOLF COURSE, ALL WITH ROLL DOWN WINDOW SHADES & FRENCH DOORS OUT TO YOUR COVERED PATIO. NICE DINING AREA W/CUSTOM WINDOW WINDOW "
"GORGEOUS HOME**2 YEAR OLD**POOL - This home is a rare gem. 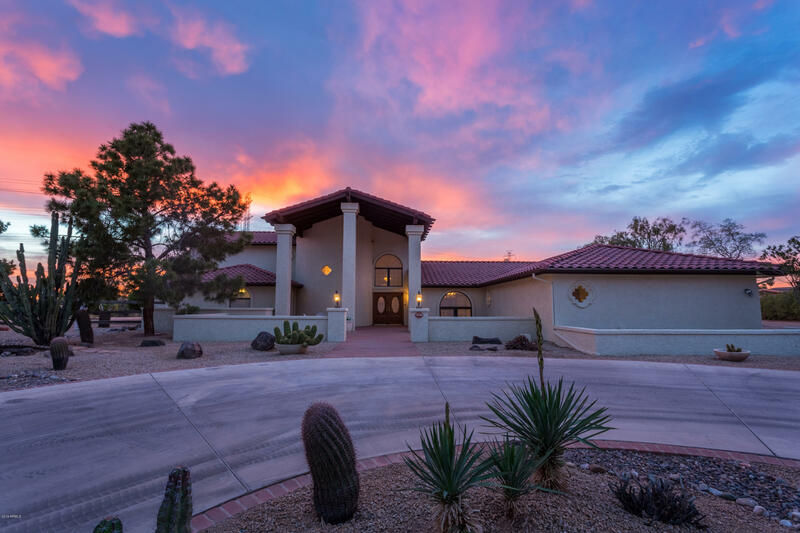 A home built in 2016 in the heart of Sun City. It is close to everything!! 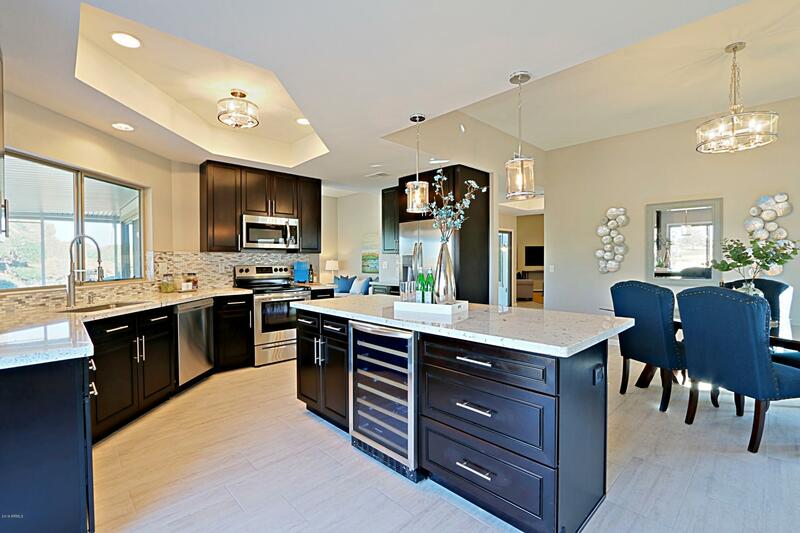 It has gorgeous granite counters and beautiful cabinets in the entertainers kitchen. The surround sound goes out to the screened in patio so you can hear it while lounging in your private pool that is less than 1 year old! This split floor plan is open airy. The garage has a 2 foot extension that makes it seem so much bigger. Garage can fit 2 cars PLUS a golf cart"
"This is the home you've been looking for! 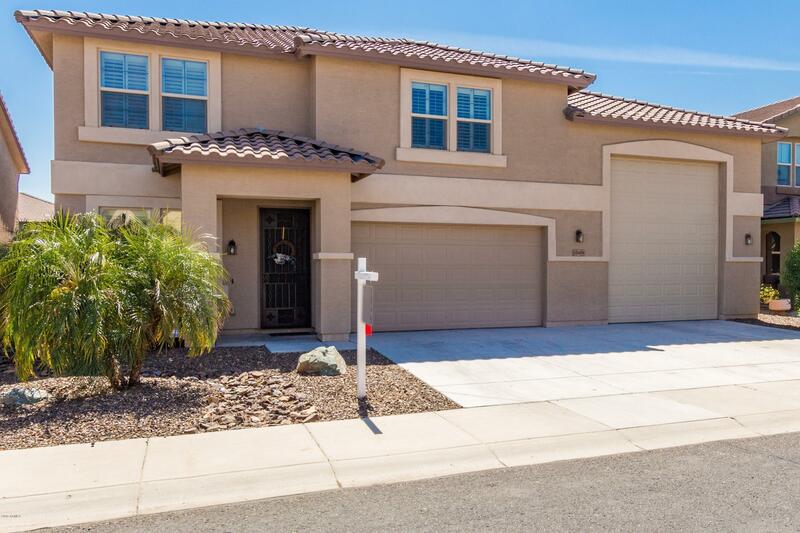 Located in the newest Sun City community of Four Seasons at the Manor, this home is less than 2 years old! Many builder custom features including oversize granite breakfast bar, upgraded stainless appliances, upgraded tile floors throughout, double patio slider, laundry room built-ins, 10 ft ceilings in BR's, upgraded lighting. Large master has full bath with extra long double vanity, soaking tub and step in shower, and huge closet. Extended garage has y"
"NICELY UPGRADED! 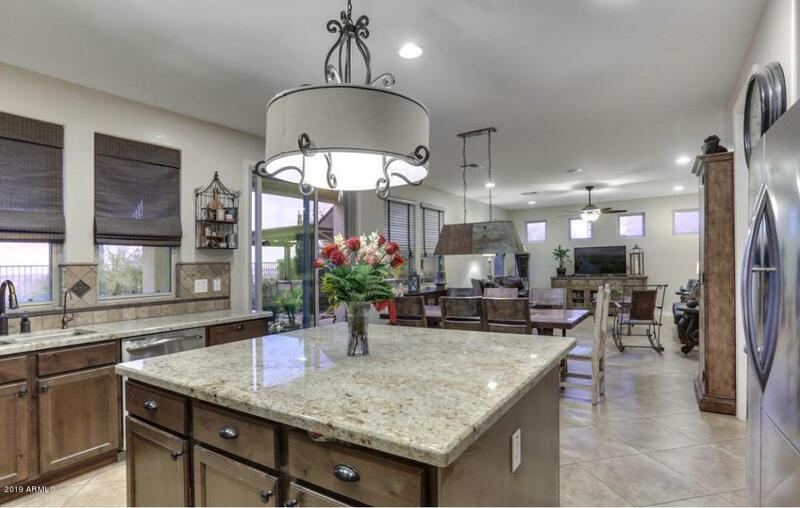 - A MODEL LIKE TURNKEY NEWER HOME in Sun City AZ! 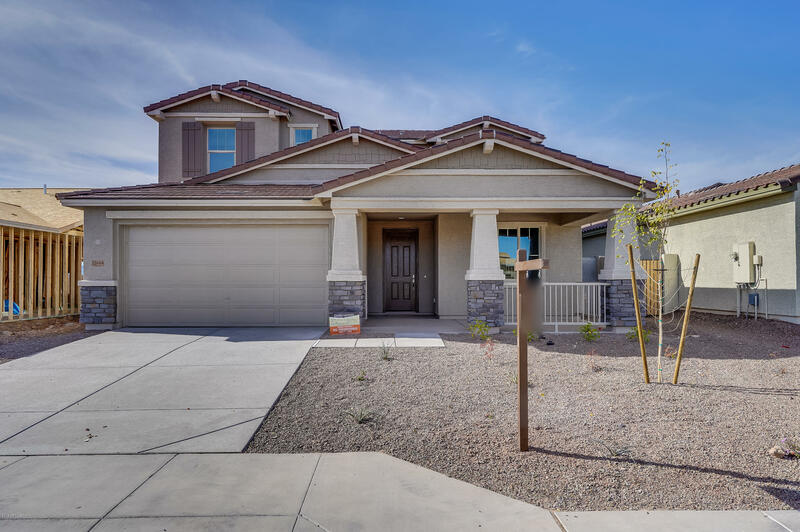 Rare opportunity to own this 2016 KHOV Firetail model w/GREAT ROOM with Dual Master Suites that includes 3 Full Baths. AMAZING UPGRADES: Modern 12''x24'' GRAY Herring Bone Tile - GOURMET KITCHEN with granite counter tops * upgraded GE Appliances including GAS STOVE / OVEN - CUSTOM BUILT IN BAR or CHINA CABINET w/ remote control LED lighting - Laundry room w/ cabinets & drop zone - BREATHTAKING BACKYARD with artificial grass, Bel"
"Home has 32 OWNED commercial grade SunPower Solar Panels. Annual Electric bills for 2018 totaled $525. Absolutely NO carpet in this home. All downstairs flooring upgraded with 24x24 tile-Also in 3 bathrooms upstairs, New Shaw Wood flooring on stairs and all the other rooms upstairs. Lots of lighting in kitchen including under-cabinet lights. Find 16 flip drawers at sinks. Neutral paint throughout entire home with 4 accent walls. Exterior painted 2015. Front yard newly landscaped. Spacious Backya"
"Spacious two story home with 4 bedrooms+ flex room + Teen space, 3.5 baths. 12'x8' sliding glass door. Kitchen with upgraded countertops, back splash and upgraded cabinets makes this a must see home. Two-tone paint, pre-plumbed for water softener." "Got Toys? 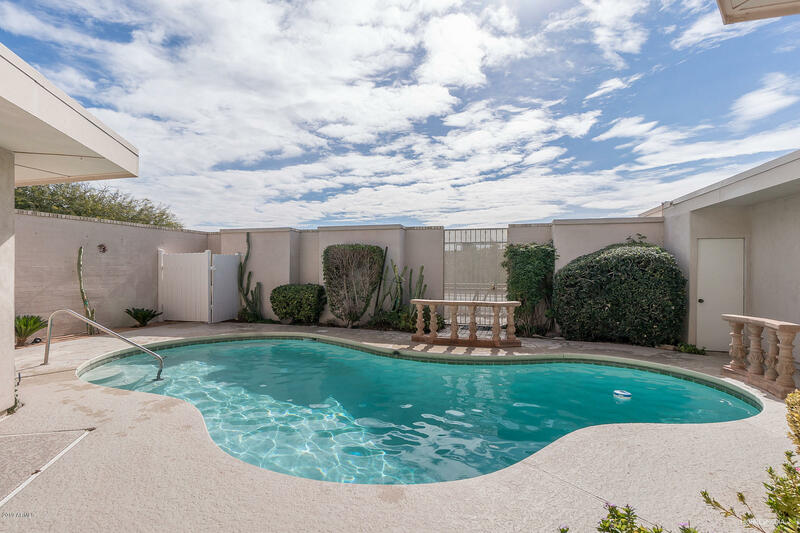 This is the ONLY RV Garage home currently available in the neighborhood & with a POOL! Garage has it all, 220v, sink, cabinets, back overheight door. House has custom travertine flooring thruout the main level that leads out to a huge travertine covered deck and a Shasta Pebbletech playpool with baja step. Built in grill & firepit complete the yard. 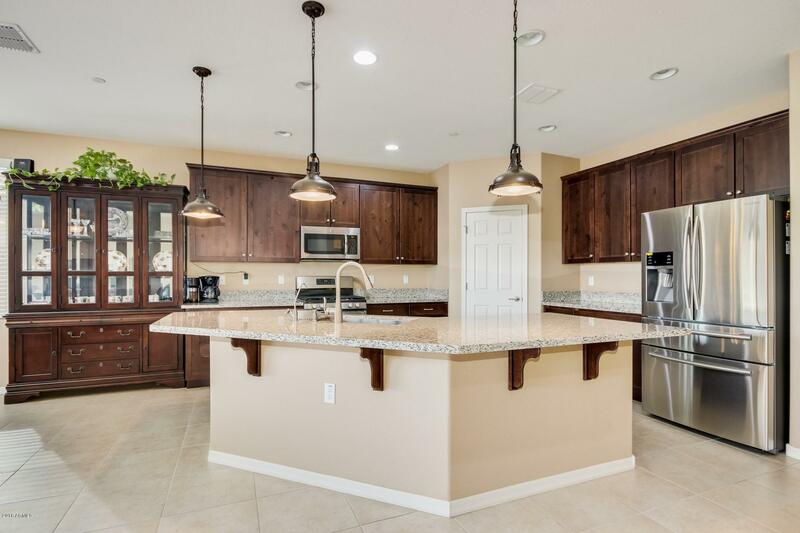 Kitchen features granite counters, oversized island & walk in pantry. 3 bedrooms and a huge bonus room that could easily become a 4th be"
"Golf course lot!!! Enjoy retirement in its best! Completely renovated and ready to move-in. 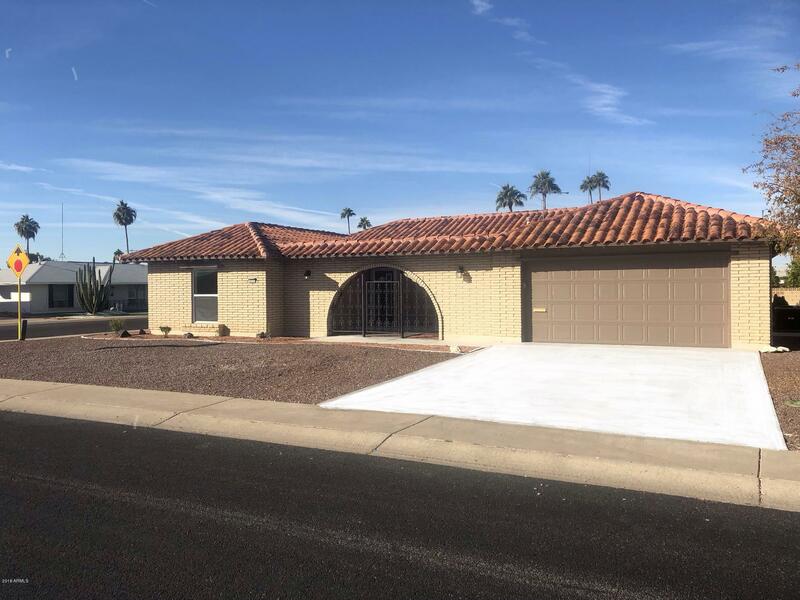 Great entertainment home, open floor plan with formal dining and living rooms, spacious kitchen with kitchen island and breakfast bar, 2 large bedrooms +den, 2 baths, 2 car garage. Highly upgraded with tile flooring t/o, carpet in bedrooms, custom cabinets, granite countertops, stainless steel appliances including fridge and wine fridge. New light and plumbing fixtures, new interior and exterior paint, g"
"**NOT AGE RESTRICTED**. . You must see this 5 Bedroom/ 5.5 Bath. Yes! Each bedroom has it's own attached bathroom with 4 bedrooms and 4.5 baths in the main home and a bedroom and a bathroom in the detached guest house.This home is fully upgraded throughout The gourmet kitchen boasts granite counter-tops, dual ovens, and upgraded cabinets with tile backslash. Wood and tile floors in all the right places. Kick back in the living room next to the fireplace that is built into a stone entertainment s"
"Remarkable fully remodeled split floor plan 3 bedroom 2 bath Home. Upgraded Tile Flooring with upgraded carpet in just the right places. Quartz counter tops and kitchen island in a spacious kitchen with gorgeous cabinets and new stainless steel appliances that includes a wine chiller! Master Bedroom is large with walk in closet, separate toilet, double sinks,and incredible spacious walk in shower. Bedrooms have built in cabinets/closets. High end brushed nickel ceiling fans, LED recessed ligh"
"Spectacular property in a great Sun City neighborhood is now on the market! 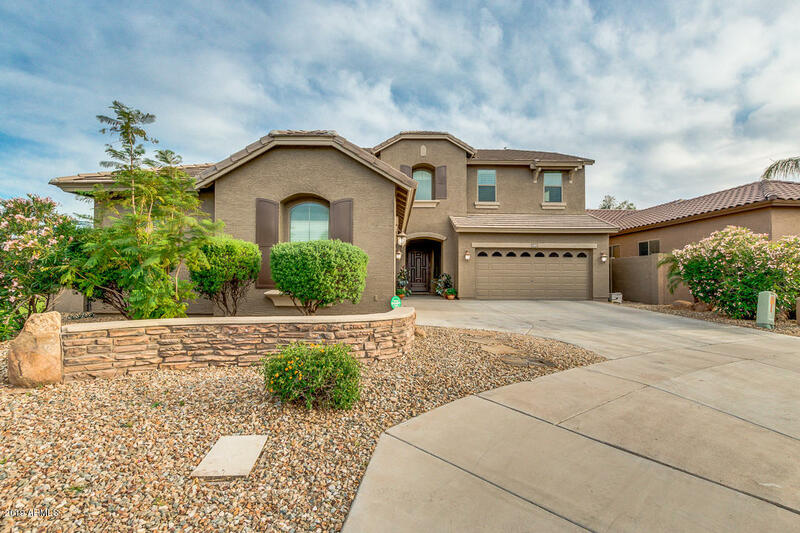 This 4 beds (Dual Master Bedrooms, 1 downstairs, 1 upstairs), 3 baths home features desert landscaping and 2 car garage. Inside you'll find custom paint, great room, wood flooring in main areas, family room, large den perfect for an office or guest room, and a spacious loft great for an entertainment area. Fabulous kitchen include stainless steel appliances, ample cabinets, granite countertops, walk-in pantry, island wit"
"Prepare to be amazed! Come and see this breathtaking 5 bed, 4.5 bath, property now! Guest house has its own entrance, closet and full bath. Private cul-de-sac street that has a park for the kids. Close to some of the highest ranking schools in Arizona. 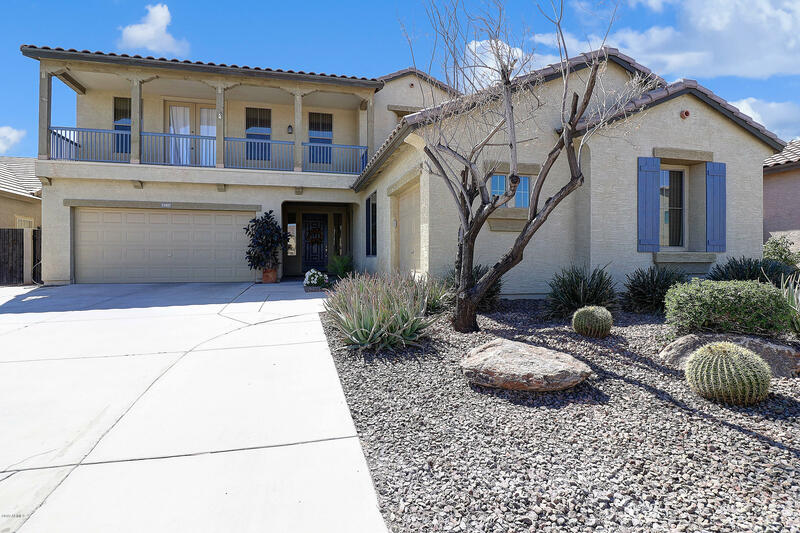 Beautiful landscaping, 3 car tandem garage with cabinets, dining and living areas, elegant light fixtures,designer paint and surround sound speakers in living room & master. The fabulous kitchen offers ample cabinetry with granite countertops, a "
"Beautiful Craftsman home with 5 bedrooms, flex room, 3.5 baths. Owner's suite on the main floor. Open concept kitchen and great room. Designer features include upgrade kitchen cabinets and kitchen countertops. Beautiful upgraded flooring throughout." "JUST REDUCED 4/18! *NOT A 55+ COMMUNITY * HUGE FAMILY HOME IN NEWER COMMUNITY * POPULAR & RARE FLOOR PLAN * 6 BEDROOMS WITH 3 1/2 BATHS * 3 CAR GARAGE * FULL GUEST SUITE DOWNSTAIRS * IMPRESSIVE ENTRYWAY * 9 FT CEILINGS * SWEEPING STAIRCASE * 18'' DIAGONAL TILE * BRIGHT & SPACIOUS KITCHEN *UPGRADED RECESSED PANEL CHERRY CABINETRY *GRANITE TILE COUNTERTOPS * S/STEEL APPLIANCES * DOWNSTAIRS POWDER ROOM * LARGE LOFT AREA - PERFECT SECOND TV ROOM OR GAMING AREA * MASTER BEDROOM HAS SITTING ROOM"
"MOTIVATED SELLER! 2 Bath/2Bed + Den. BUILT IN 2016!!! Beautiful, BLUE RIBBON, BEST OF TOUR AWARD home! 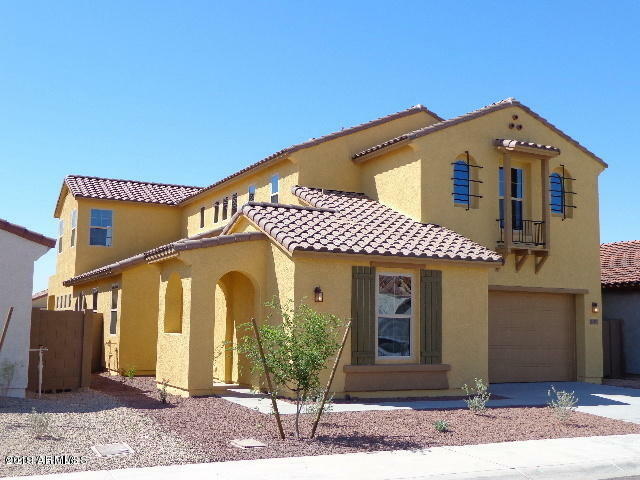 Spacious 2 YR old home in Sun City w/access to all 7 Rec. Centers. 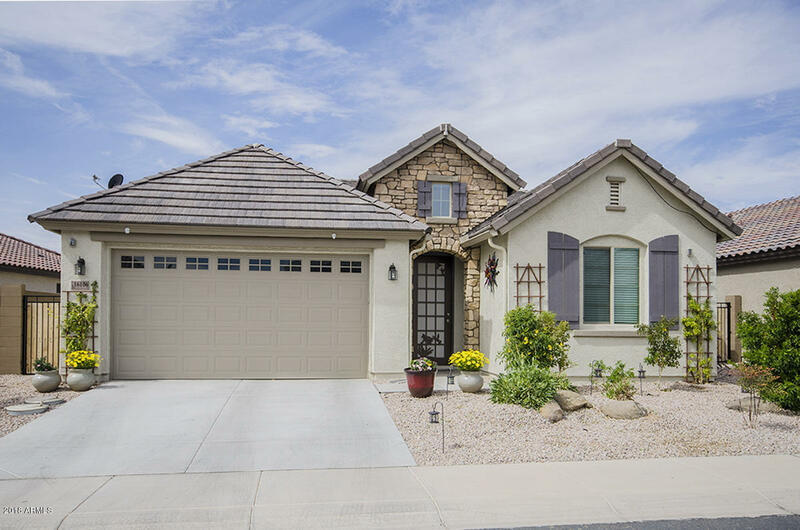 Open concept with premium lot & front elevation w/lots of privacy!Stunning kitchen with upgrades throughout -granite countertops, gas range/stove, & lots of storage!Beautiful tile throughout & carpet in bedrooms. 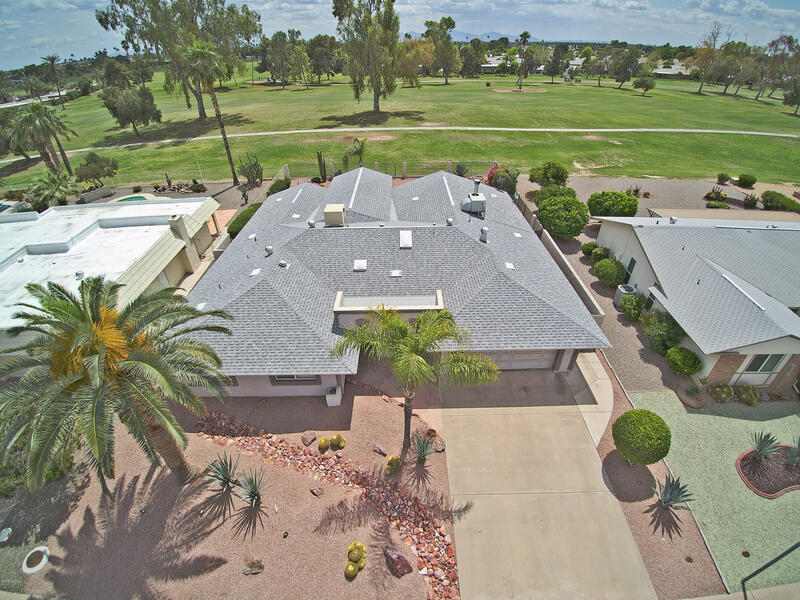 Ceiling fans throughout & 3-zoned AC w/additional insulation throughout home! Extra large Master suite separated"
"TURN KEY! Completely Updated and Move in ready! This Home has a laundry list of Updates, Upgrades, and Final touches you have to see in person to appreciate! 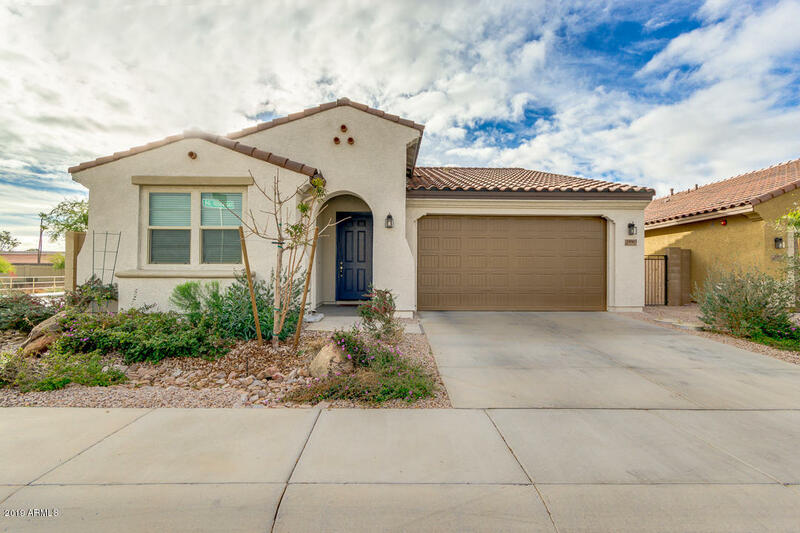 Just under 2500 Sqft, this 3 Bedroom 3 full bath ENTERTAINMENT Home has Everything you need to reside in the Heart of beautiful Sun City! Exercise/ Den w/ sliding barn doors, New Lighting, GFI's, Plugs, Ceiling fans, Paint, Carpet, Updated tiled showers, the list of items upgraded are too many to list! All Bedrooms have their own private a"
"Savor lavish views and a magnificent location in this stunning three bedroom, two and one half bath home. Nestled on the luxurious Willow Creek Course with breathtaking views of the mountains and lakes, a sparkling pool and peaceful front patio invite you into this amazing property. 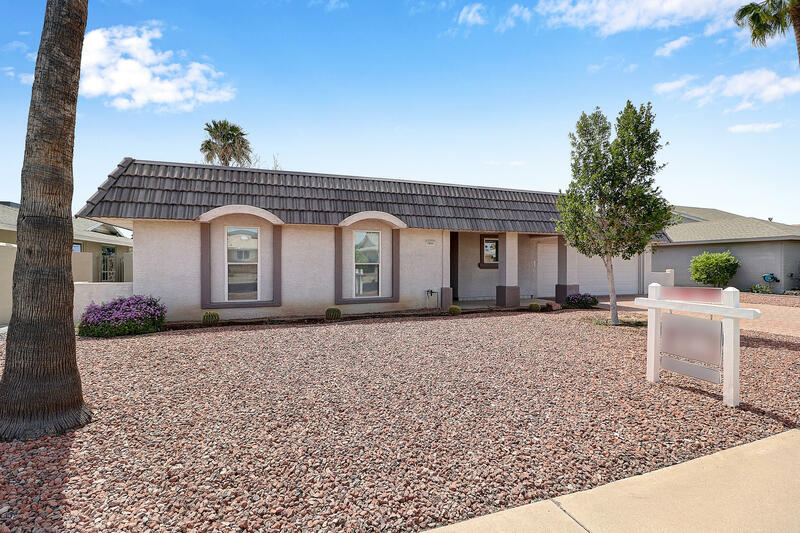 Gleaming, newer 24-inch tile flooring, fresh paint and soaring ceilings throughout with a solar system and security lights on the windows and doors. Prepare a meal in the gourmet kitchen with double ovens or enjoy br"